Republican Jim Patterson currently represents Assembly District 23 and will not be termed out until 2024. Patterson is expected to easily win re-election in 2016. 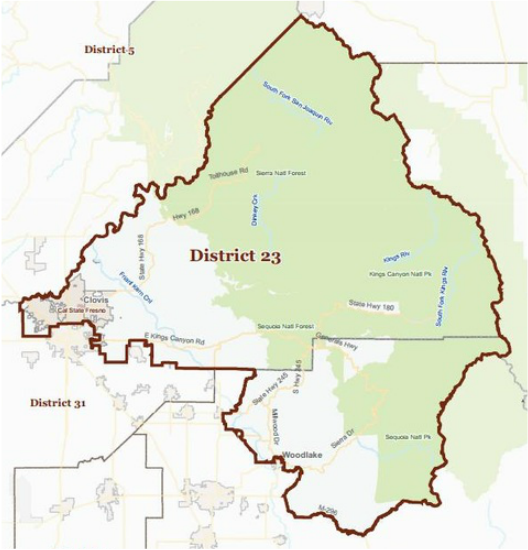 Jim Patterson represents the 23rd Assembly District in the California State Assembly and is honored to serve portions of Fresno and Tulare counties, including the communities of Auberry, Centerville, Clovis, Fresno, Friant, Minkler, Shaver Lake and Three Rivers. Elected to the Assembly in 2012, he is currently serving his second term. Jim and wife Sharon have lived in Fresno for most of their lives, raising three children, and now three grandchildren in the Central Valley. He spent most of his professional career as a businessman and broadcast executive owning and operating radio stations in California and Idaho. Serving two terms as the Mayor of Fresno from 1993-2001, he inherited the leadership of a city in free-fall with exploding crime levels and out of control auto thefts. After eight years of focused leadership, Jim left the City of Fresno with a $20 million general fund surplus, a AAA credit rating, over a billion dollars of new business approvals that created thousands of new jobs, and a reborn reputation for achievement that the National Civic League recognized when it designated Fresno an All-America City in 2000. Fresno residents saw crime plunge to a 25-year low. Homicides dropped to less than 25 a year and car thefts were down nearly 75 percent. Jim currently serves as Vice-Chair of the Assembly Utilities and Commerce committee. Jim has introduced legislation focusing on improving the business climate in California and is dedicated to streamlining the often frustrating vocational licensing process. In 2013 Governor Jerry Brown signed AB 1028, which fast-tracks licenses for vocational nurses by removing government red-tape. Making sure the ballots of our military men and women serving overseas are counted is also important to Jim. He fought hard for legislation to give those ballots three extra days to make it to California to be counted. Having adopted three children, Jim and his family are passionate advocates for adoption. He is determined to promote adoption during his service in the Legislature and has authored several laws that streamline the process, making it quicker and easier for parents seeking to adopt.